Thank you to Chipasha’s Educational Benefactor, Dede D’Arcy! Thank you to Hope’s Full Sponsor, Diana Spencer! Thank you to Chama’s Educational Benefactor, Chris Erikson! Thank you to Monday’s Full Sponsor, Lew Jones! The third born in a family of seven, Precious stays with her mother and siblings. 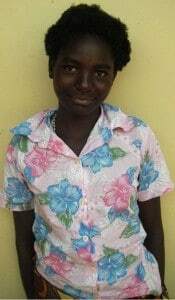 When she completes school at PEAS secondary, Precious would like to be a medical doctor. Thank you to Precious’ Educational Benefactors, Bob and Mary Lou Hostetter! Thank you to Ruth’s Full Sponsor, Sue Deuber! Thank you to Eunice’s Full Sponsor, Kyira Korrigan! 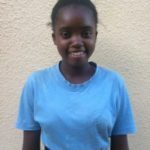 Loreen is an academically gifted pupil who was selected to attend the best school in the Province, Laura Girls. She is a single-orphan having lost her Father when she was 7 months old. Her Uncle who had been supporting her Mother and her siblings passed away last year. We have seen that her intelligence will take her far if she is provided with the opportunity to learn. Thank you to Mwenya’s Full Sponsor, Linda Short! From a family of four, Patience’s Mother supports her children by farming what she can, having lost her husband a long time ago. 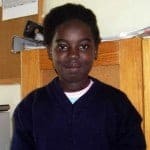 This year, she was selected to attend a new school, PEAS academy, run by a UK-based organization which seeks to provide quality education at affordable rates. She is in Boarding there in grade 8. Her family has high hopes for her, and so do we. Thank you to Patience’s Educational Benefactor, Ellen Berman! My name is Grace Mabo, I was born on 15th May,2004. I am the third born in a family of three. I am a single orphan, living with my aunty who has three children. My dad died when I was 5 years old. My mom stays in Luapula with my Grandmother. My hobbies are singing, dancing, reading novels and making new friends. My ambition is to become a pharmacist and also have a house where I will also be helping young children in need. I also like debating and trying out my ideas, thats why I have joined Jets and Debates club in school. I am the only girl in the family and the rest are boys. I love poetry a lot – I write short poems about different events and things. Thank you to Grace’s Full Sponsors, Jane Deuber and Mario Villacres! 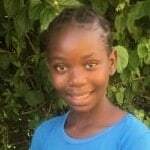 Mwenya is a quiet girl coming from a very rural area outside of Kasama. Her mother is in her fifties and struggles to support her five children through subsistence farming, “The reason I want to complete school is that I want to be independent and support my Mum and siblings. 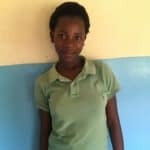 I would want to attain skills and knowledge so that I can be either self-employed or work in the government to serve the nation.” Mwenya had outstanding results on her national exam and her persistence and family struggle are what brought her story to a teacher who encouraged her to apply for sponsorship. She is now in boarding at PEAS secondary, the first school of its kind in the nation. Thank you to Mwenya’s Full Sponsor, Lynnette Mwangala Chisuse! 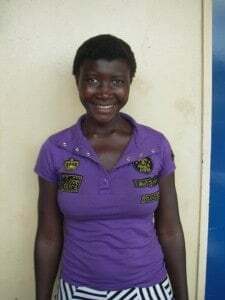 Rejoice lost her father in 2011, and since then her mother has been working as a house helper, earning around $50 a month. She is one of five children and as school fees increase every year her mother is struggling to put all of her children through school. Bakashana is looking for someone like you to help Rejoice to become educated. Thank you to Rejoice’s Educational Benefactor, Tom and Carol Deuber! Rhoda came recommended by a Peace Corps Volunteer who taught her for two years. Though short in stature, this young woman is a force! She is being housed in our Boarding House while she studies at Laura Girls. Her mother and father support five children through subsistence farming. Thank you to Rhoda’s full Sponsor, Wiljam Bruno! Miriam’s smile speaks to her strength, as she has had a very challenging few years. Miriam, 15, and her brother lost both of their parents in 2012, and went to live with an Aunt in a deep village named Shiwa`ngandu. Soon after settling into life there, their Aunt passed away, leaving Miriam and her brother orphaned once again. She recently moved to Kasama, where she is living with her “Mama” (Grandmother). Miriam’s grandmother is quite old and lives in a township very far from Kasama. 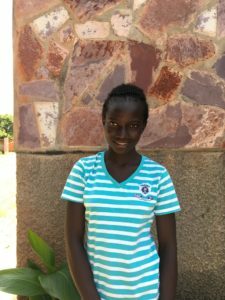 Despite all of this hardship, Miriam did well on her national exam and was selected into the best girls’ school in Kasama. She knows that her grandmother cannot support her and her brother with a subsistence farming lifestyle, and personally fought for a place at school, and in the Bakashana program. Thank you to Miriam’s Educational Benefactor, Mukuni Simpungwe! Theresa’s father passed away the year she was born. Since then she has lived with her single mother who has struggled to get by without any family support. She struggled to support Theresa through working different odd-jobs until she secured a job as a night guard, though her pay is only around $50/month. On this humble salary, Theresa’s Mother has struggled to support her young family. 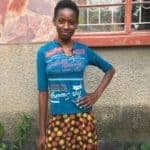 Theresa, against all odds, has done very well in school and was selected to begin grade 8 at the best private school in Kasama. 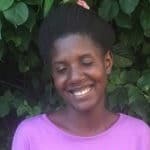 Can your family help Theresa’s family? Thank you to Theresa’s Full Sponsor! Mapalo is the first born of 5, 3 girls and 2 boys. Her Mother is a subsistence farmer who stays in a village outside of Kasama. Her mother, not only responsible to care for her 5 children, also cares for her aging parents. With the help of Bakashana, Mapalo with be the first in her family to be educated past grade 7. Thank you to Mapalo’s Educational Benefactor, Capri Harrel! Precious is 15 years old, and comes from a village about 20 km outside of Kasama. Her Grandmother has been her primary caregiver since she lost her parents some years ago. Precious had higher marks than any pupil (male or female) at her school in the village of Kalafya. 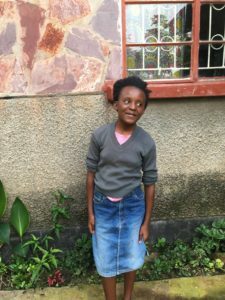 Her grandmother walked to Kasama Girls to fight for a space for her granddaughter, but was discouraged to find that there were no options for sponsorship. Returning home disappointed, the family was very excited to learn of the opportunity to be sponsored by Bakashana. Precious’ older brother has been supporting the family by crushing and selling stones in a make-shift rock quarry, but couldn’t raise enough to pay the school fees. 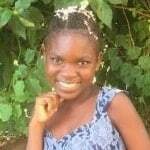 Precious is quite shy and quiet, but incredibly smart and motivated. We look forward to helping her bloom as she works with our program and builds her confidence! Thank you to Precious’ Full Sponsor! 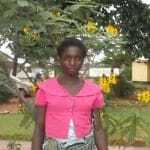 Naomi is a 15 year-old girl coming from a rural village in the Eastern Province of Zambia. Her mother moved them there to live with Naomi’s father’s family. 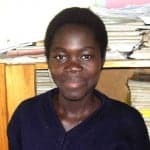 Unfortunately, when she was in third grade, Naomi’s Father died, leaving her mother alone with three children and no support from her late husband’s family, far away from her own. Her mother returned to the village to farm, but realizing that the place was rural and without access to quality education, Naomi and her two sisters came to Kasama to live with an Aunt. Naomi struggled in the beginning as she had to learn a new language and adjust to a new culture. 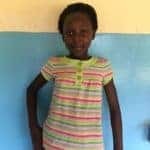 She overcame challenges and is now in grade 8, and with your help, there is no limit to how many other she can help! Thank you to Naomi’s Educational Benefactor, Andrew Jo! Gertrude lost both of her parents at a young age and has since lived with her aging grandmother. Though too old to work, Grandma provided for Gertrude and her younger sister by selling things here and there as well as relying on the kindness of others. 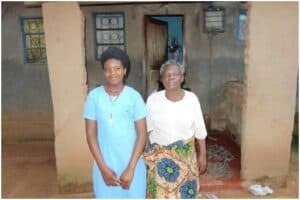 School fees were too much for Grandma to manage so, after Gertrude did well on her grade 7 exams, her Grandmother brought her here to seek assistance from Bakashana Program. 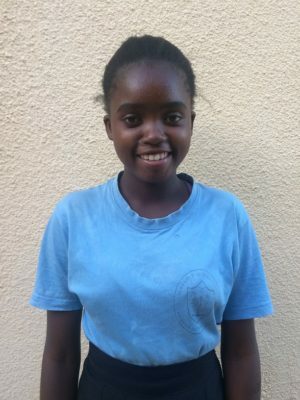 Gertrude, due to her exceptional results, is now studying at the best girls school in the Province and enjoying the life and study time that living at the Bakashana Boarding House has afforded her. You can help Gertrude become a part of your ‘extended family’ as well! Thank you to Gertrude’s Full Sponsors, Keith and Joan Westpy! Ezra is an orphan whose parents died in 2013. Since then, she has moved around the Province to stay with any relative who could temporarily accommodate the challenge of another child. Last year, she was studying at a Mission school where the Mission’s Sisters and Brothers were assisting her. She has always seen school as an opportunity to change her life’s trajectory and pursue a better future. 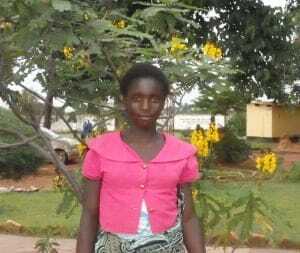 After passing all subjects on her grade 9 exam, she came to live with an Uncle who lives about 20 miles from Kasama. Her Uncle has 8 children of his own and stays with his aging parents as well as one of his grandchildren. 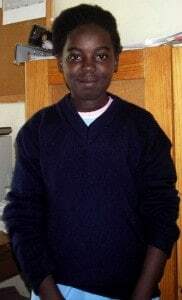 Ezra is now enjoying boarding at Bakashana Boarding House and looks forward to continuing to work hard in school. Thank you to Ezra’s Educational Benefactor, Linda Short! 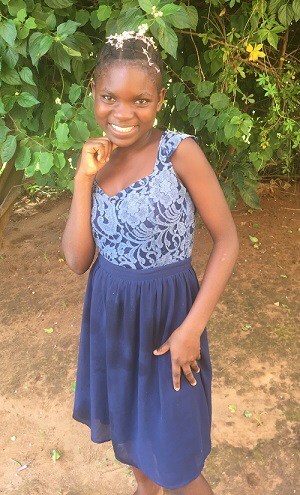 Edna is in grade 8 and recently graduated from a small, rural school called Katito near Mbala in the very North of Zambia. 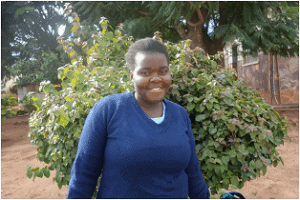 Before becoming a full-time boarding student in Kasama, Edna lived with her parents who are subsistence farmers. 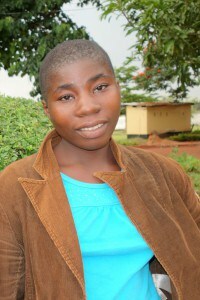 She is a Mambwe by tribe, yet like many Zambians she is a skilled linguist and speaks three languages, including English. She passed with exceptional marks and is excited to begin testing her English comprehension and fluency at Kasama Girls School. 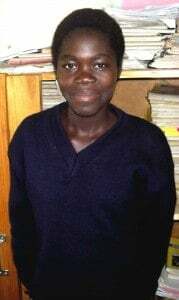 Edna was recommended to Bakashana by a hard-working and dedicated Peace Corps Volunteer named Joon, who teaches English at Edna’s school, and had the pleasure of working closely with Edna in his classes. 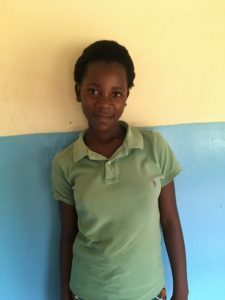 Joon assured us that Edna’s motivation and dedication will help her succeed in school, and that without the help of Bakashana she would not have had the chance to continue her education. Thank you to Edna’s Full Sponsors, Kim and Jason McPhee and Family! 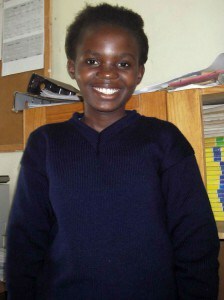 Ruth, grade 9, is a quiet young woman who enjoys science and math classes. She lives with her mother and two siblings in a single room, in a compound which was previously a school classroom block. During the farming season, Ruth stays alone with her two younger siblings, supporting and caring for them, while her mother works to provide for the family by farming in a village more than 100KM away. This is her first year at Laura Girls School, and she has been inspired by her teachers to become a Sister. Her father left the family when she was 5. 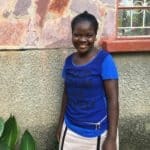 We selected Ruth because of the maturity and hard work she has shown, not only in succeeding in school, but doing so while supporting her two younger siblings on her own, at only 15 years of age. Thank you to Ruth’s Full Sponsors, Shirley Dorsey and Barbara Chambers! Hope* was brought to our resource center late in the night by her distant cousin. They were both in tears and we learned of Hope’s difficult last three years during which she was continually sexually abused by an uncle. 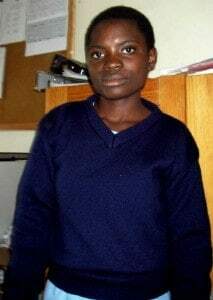 Forced to drop-out of school in grade 7, she had spent time working as a maid in the capital Lusaka and had recently returned back to the home of her abusive uncle all before the age of 16. With no where to go, she turned to Bakashana. 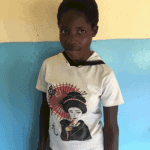 Hope is now enrolled in school and attending everyday. We set-up a safe stay for her and she is, for the first time in her young life, enjoying being a young girl free of worry and abuse. 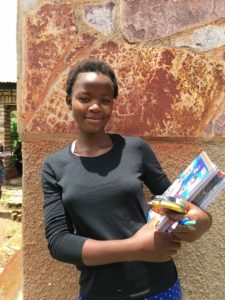 Our resource center has allowed us to be a beacon in the community for young women and girls facing tough times, including “Hope” – who now has a sponsor! * “Hope’s” name has been changed and her face hidden for anonymity. Thank you to “Hope’s” Full Sponsor, Ingeborg Holliday and Family! Hilda is in grade 8, she passed through grade 7 while living with her mother in the village of Chiba, a densely populated suburb of Kasama. Hilda and her mother are both strong, dedicated women. 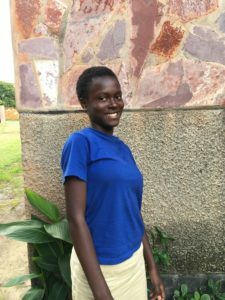 After Hilda’s father left the family more than ten years ago, she continued studying and going to school while increasing her responsibilities at home. Hilda’s mother is often sick, and works tirelessly every day to sell fritters and other cooked snacks in the market near their home. Life for this family is especially challenging because the desertion by Hilda’s father left 5 children without a solid income, and the farming land in the village in which they live has been turned into bars and houses. Despite these challenges, Hilda is proud to begin secondary school, and grateful to Bakashana and those who support us for the opportunity she has been given to eat three meals a day and dedicate her life fully to her studies. Hilda’s mother is also grateful, and continues to work every day to assist her other 4 children, 3 of whom are still in school. Thank you to Hilda’s Full Sponsor, Linda Short! 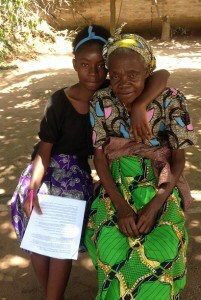 Memory is a 13 year-old grade 8 pupil and lives with her Grandmother in a housing compound a great distance from school. She is the last born of four children – three girls and one boy. Her elder brother is in grade 9 and the school fees for both he and Memory are too much for their Grandmother to afford. Grandma is a humble maize farmer and her health is failing her. Her legs are too weak for her to farm much anymore, so she relies on Memory and her two older sisters (both of whom have children and are not yet 20) to farm. Memory’s sisters have assured us that they will make up for Memory’s share of the farming, so that she has an opportunity to go to school. Thank you to Memory’s Full Sponsor, Catherine Bruns! 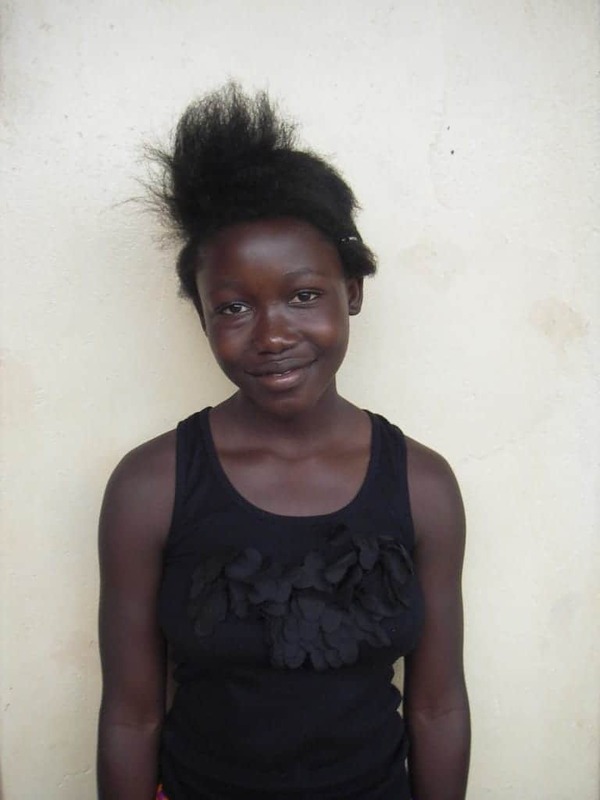 Sandra, grade 8, has four brothers and sisters. She lost her father some time ago and her Mother works as a housemaid at an office in Kasama. Due to high rent in the town, Sandra’s mother was forced to move to the village, a distance she travels every day to and from work. 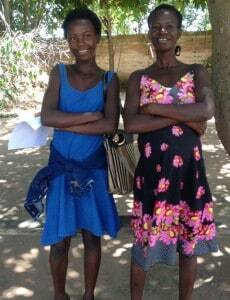 The distance is too great for Sandra to walk to and from school, so she is living with an older sister in a shanti compound within Kasama. When we asked Sandra what requirements she needed for school, she simply said “food”. 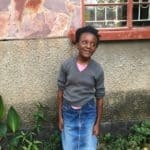 We are working with Sandra and her family and hope that, with sponsorship, we will be able to provide Sandra with a bike so that she can be living with her mother and cycling to school. Thank you to Sandra’s Educational Benefactors, Tom and Carol Deuber! Naomy Chola is 15 years-old and is full of personality with a wonderful smile. She is from the Village of Mulanshi. 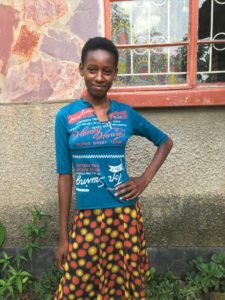 Because her parents couldn’t afford to send Naomy to boarding school in Kasama, she would have failed to continue her education because there are no secondary schools in her area. 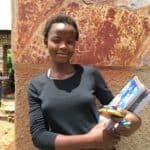 Naomy is now free to focus on her studies while boarding at Kasama Girls’ School, and her continued education greatly reduces her risk for early pregnancy and child marriage while increasing her future opportunities. Rabecca is in grade 9. 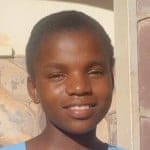 Her parents are subsistence farmers and while they are supporting her and her many brothers and sisters, there was not enough money to send her to school after finishing grade 7. 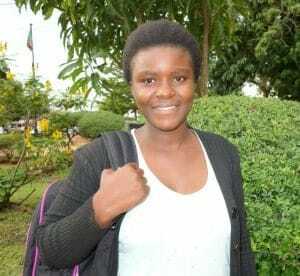 Her marks were quite good, and Bakashana heard her story and decided to select her to attend Laura Girls School and continue her dream of becoming a nurse. First, she promises to put all of her effort into school, and make her family proud. Thank you to Rabecca’s Educational Benefactors, Gabriele Garcia and Felipe Brescancini! 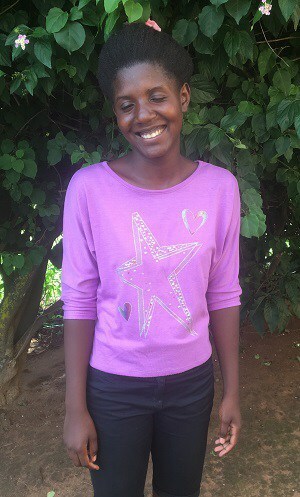 Chishimba, grade 8, comes from a small village called Henry Kapata, on the outskirts of Kasama. Her father died when she was very young, and her mother left Chishimba and 2 other children with her sister and relocated. 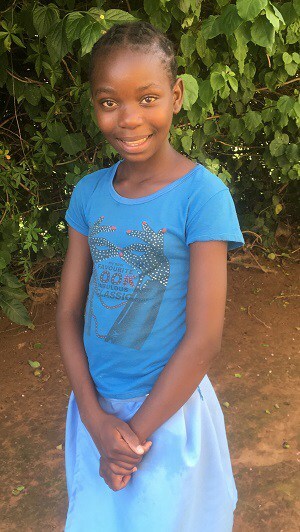 Chishimba was blessed to have an aunt who cared for her and made sure she had enough food to eat, and the chance to go to school. 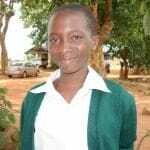 Still, when it came time progress to secondary school, Chishimba’s aunt did not have enough funds to support her own children and Chishimba at the same time. 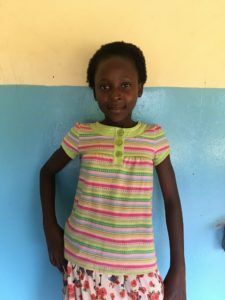 Bakashana heard of Chishimba’s story and her excellent marks in school, and knew it would be a shame for such a hard-working girl, supported by such a devoted aunt, to stop her schooling prematurely. 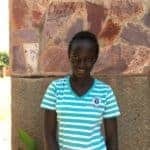 She is now learning at Kasama Girls School on full sponsorship, and she looks forward to earning a degree and helping her Aunt and family in the future. Thank you to Chisimba’s Full Sponsors, Sandra Martinez and Gaya Shakes! 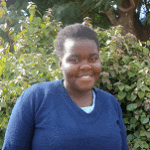 Natasha, in grade 9 this year, is a special selection from Bakashana. We pushed her acceptance into the school after learning of her story from her class teacher at a basic school here in Kasama. 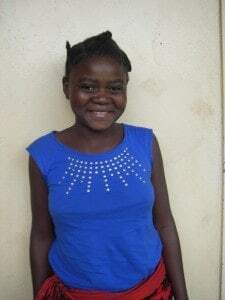 Natasha’s mother is a single parent raising 8 children, and Natasha has been attending school without paying fees for several years, as the administration at her local basic school saw her potential, and the difficult family situation she was facing, and would not turn her away. 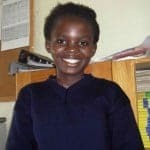 Despite walking many miles to and from school each day, often on an empty stomach and frequently soaked in the rainy season, Natasha still managed to pass her exams. 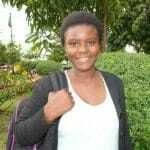 When Bakashana visited her previous school to investigate the stories of some other potential grantees, the administration adamantly campaigned for Natasha’s sponsorship. Her class teacher was almost in tears when describing the girl’s story, and the inspiration that she provides for her classmates. We are excited to provide Natasha with a place in boarding, where she will have food and a short, dry passage to her classes. 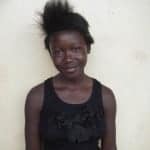 The prospects for her successful education have just increased significantly, and she is excited to show her potential. Thank you to Natasha’s Educational Benefactors, Melissa and Trent Lanz! Ethel had the highest score of any of our new grantees. Her bright smile and gentle demeanor hide a troubled story. Ethel and her three siblings were living with her mother until her drinking became such a problem that she left her children. At that point Ethel went to live with her Aunt whose husband died 12 years ago. Ethel’s Aunt has taken on the responsibility of caring for her four nieces and nephews in addition to her two children. Ethel’s Auntie sells salt in the nearby market but struggles to provide for so many dependents. 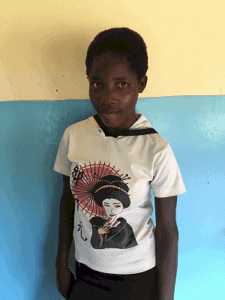 Ethel loves school and is very excited to be part of the Bakashana program. Her marks and attitude are excellent, and she is sure to succeed. Thank you to Ethel’s Full Sponsor, Jonah Gropper! Queen Musonda is 15 years old from a village very far from Kasama named Simweo Mwanankonde. She was the only pupil in her grade 7 class to pass her exams. We investigated and found that one month after schools had opened, Queen still had not reported to school. While this could have meant the end of the education road for Queen, Bakashana got in touch with the Head Teacher at her primary school and inquired about her situation. We found that Queen’s mother is alone in supporting her children, and had a failed maize harvest last year. It is for these reasons that she was not able to come up with more than 1,000 Kwacha this term (more than $170) required to enroll her daughter in school. Imagine the implications for a family that lives on “less than $1 a day”. 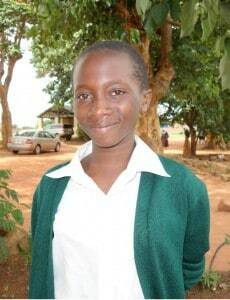 Today, Queen is attending school thanks to Bakashana and her sponsors! Thank you to Queen’s Full Sponsors, Cindy and Ed Valentine! 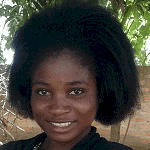 Esther had the highest marks of any young woman who sat for selection into our program this year. She lost her Father in 2002, and then her mother in 2010. 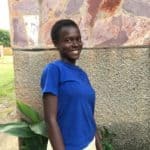 With the help of Bakashana and her sponsor, Esther went from living in a grass-thatched house with her 19-year-old brother to staying in boarding at Laura Girls, the finest Boarding accommodation in Kasama! She is the top perfoming pupil in her grade and will go far, having been given the chance. 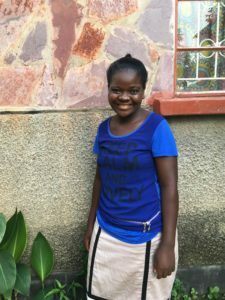 When we asked Esther what she wanted to do when she finished school, she said “I will be a doctor.” If she keeps her spirit and grades up, anything is possible! This young woman is determined! Educational Benefactors, Cathy and Glen Bengson! Luswepo is 15 years old, and her stature does not match her charisma! She is slight, but strong! Luswepo stays with her Mother and three siblings. We were surprised when we visited her home, as the directions took us to a more “well-off” part of town. We found that she and her family have struggled since the loss of her father in 2011. They are challenged by the fact that they have no land to farm, and no other way of making an income. This means that they are living in need, but surrounded by abundance -surely a challenging situation for anyone, let alone a teenage girl. 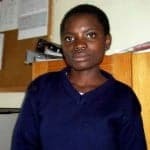 Luswepo understands the reality of her situation, and sought out our staff after preliminary interviews, giving us her mother’s phone number and asking us what time we could be expected to visit her home. She was overjoyed to learn that she had been selected to join the Bakashana family. 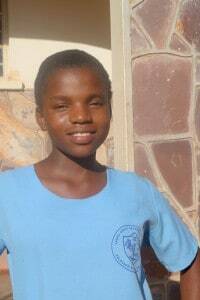 Janet Mulenga is 16 years old, and loves to play netball. Her father passed away in 2003, leaving her mother to support she and her 7 siblings through subsistence farming. When we visited Janet and her mother in her village, Itinti, to explain the goals of our program, Janet’s face lit up with excitement before she silently bowed her head in prayer. 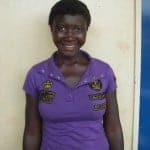 Having thought that her opportunity to continue her education had dwindled, Janet was overjoyed to learn that she had been selected to receive support from Bakashana. 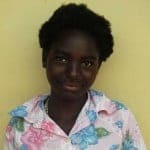 Janet is the first woman in her family to attend secondary school, and is so thrilled to have picked up a full sponsor who has made the sacrifice to support her and join her on her educational journey! Thank you to Janet’s Full Sponsor, Paul Sawyer! Given’s story is so extraordinary that she is the first woman in college who we have accepted into the program. 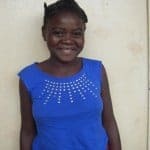 We first met Given when she was brought to our offices by an Uncle who wanted so badly to help her that he sold his most prized possession – his bicycle – in order to get her established with some basic school supplies. After meeting Given, we were told by three community leaders about her determination and how deserving she was of assistance, given the hard life that she has lived. Since the beginning of her life, things haven’t been easy for Given. Her mother struggled with mental illness throughout her childhood, and many days would go by when there was only one meal for she and her sister to eat in a day. Through these challenges, Given made school her refuge, pouring everything she could into her studies. Her hard work paid off, and she was accepted into Kasama Teacher’s Training College in 2016. She tried her hardest all year to find support but failed. That’s when she came to our offices. She is now in her first year of teacher training, and looking forward to becoming a teacher. Thank you to Gertrude’s Educational Benefactor, Joon Park!